Brass – Recommended in securing brass Cable Glands and Accessories to a gland plate or into equipment. In metric thread form CMP offers brass locknuts in a choice of standard duty and heavy duty options for sizes up to and including M32. The part numbers are distinguished by an additional letter H, e.g. 20LN = standard duty, and 20HLN = heavy duty. From size M40 all brass metric locknuts are considered to be heavy duty. Zinc Plated Mild Steel – A cost effective alternative to brass locknuts and should be used only in dry, low humidity conditions. Aluminium – Recommended when installing aluminium Cable Glands to prevent the galvanic corrosion which can occur when dissimilar metals are coupled together. Stainless Steel – Corrosion resistant with increased strength at high temperatures. Please refer to ordering reference numbers, e.g. 20LN4 for M20 Stainless Steel Locknut, 050NPTLN4 for 1/2” NPT Stainless Steel Locknut. 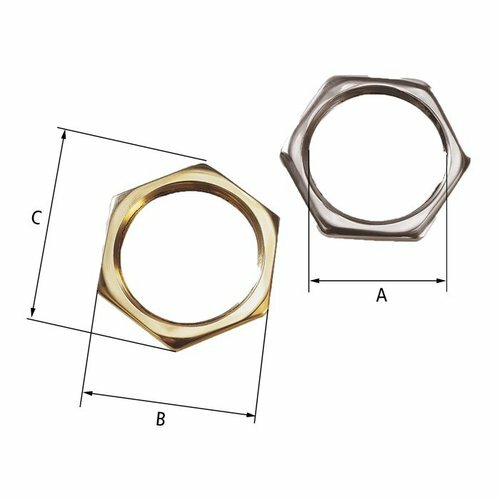 Metric Ordering Reference (Brass) Thread Diameter ?"A?" Minimum Thickness Across Flats Dimension "?B"? Across Corners Diameter ?"C?" NPT Ordering Reference (Brass) Thread Diameter ?"A?" Minimum Thickness Thickness Across Flats Dimension "?B?" Across Corners Diameter "?C"? Ordering Reference (Brass) Thread Diameter ?"A?" Minimum Thickness Across Flats Dimension "?B?" Across Corners Diameter ?"C?" Ordering Reference (Brass) Thread Diameter ?"A?" Minimum Thickness Thickness Across Flats Dimension ?"B?" Across Corners Diameter ? "C"?